Think That Government Should Enable Gambling Addictions? Being the wife of a compulsive gambler that has borrowed $72,000 @ 20% interest, I completly agree with your blog on gambling. Our governments are allowing/encouraging this destrictive behavior to all. I use to go to the casinos with my husband, gamble $100 here and there, but now I want to throw up when I see or hear an advertisement for these pits of dispair. And of course when I found out about the problem, it wasn't a problem. I had the problem for not allowing him to do what he wanted. Our marriage is hanging on threads right now, my life will never be the same, his life for sure will never be the same. Why is there such encouragement for an addiction. Ultimately, that is what it is turning into more and more. While I prepared for writing a message on this weekend's message, I've decided to go in a different direction. As regular readers of Better Living will know, we've been talking about spiritual gifts at Friendship during this Advent season. Because this is likely to be the last Sunday on which many of our members will be around before Christmas--most of our folks are from other places and often visit family, I thought I'd "put a bow" on things, so to speak. Our annual congregational meeting also happens after Sunday worship. So, a little vision-casting will be appropriate. In any case, here are a few thoughts about tomorrow's appointed lesson. 1. For general comments on the Gospel of Luke, Advent, and the ministry of John the Baptizer, go here. 2. For great commentaries on this text, go here, here, here, and here. Servanthood is the gift of those people behind-the-scenes in the Church who pitch in to make ministries effective, never calling attention to themselves. I’ve been a Cincinnati Reds fan since I was fifteen. So, you can imagine how pleased I was with their 2006 season. After years of frustration, I saw the new ownership make a series of trades that caused the Reds to be more competitive. The Reds have a lot of good players. But if I were asked to pick the team’s most valuable player, it would be a guy who’s never established himself at one position or a set place in the offensive line-up and who probably isn’t strong enough to play a full 162-game schedule. My choice for the Reds 2006 MVP would be a utility player named Ryan Freel. Actually, the whole world depends on “utility players,” people whose diligent daily efforts make our human endeavors work: the clerk at the department store, the school custodian, the administrative assistant, the parent who serves as room mother or room father, the middle school trip chaperone, the garbage collector. They aren’t the grand visionaries who plot or plan the project; they’re the ones who make it go. In the Church, the utility players are those who possess the gift of servanthood. An old saying, wrongly attributed to Abraham Lincoln, observes, “God must have loved the common people. He made so many of them.” Whoever first said that may have meant it as a backhanded compliment. But servanthood, seemingly the most common of attributes, is actually the quality Jesus Christ most values in His people. To demonstrate how important servanthood is, remember that on the night of His betrayal and arrest, Jesus served His disciples, washing and toweling down their filthy feet (John 13). Jesus also said that in His Kingdom, “the last will be first, and the first will be last” (Matthew 20:16). All Christians are called to be servants, of course. But some possess a special passion and ability to help out wherever needed. They have the gift of servanthood. They don’t have the special talents we might associate with the other gifts. But these “utility players” make the Church successful. They’re people like Charlie, someone you’ve heard me talk about before. A painter by trade, Charlie was never president of our home church. He never led the education program. But he filled in and assisted in dozens of ways, from helping re-roof the building to providing transportation for our youth activities. Others may get more notoriety, but nobody does more to advance the mission of the Church than those quiet, unassuming Christians to whom God has given the gift of servanthood. Instead, he suggests Dems would do well to nominate New Mexico Governor--and former Ambassador, Energy Secretary, and Congressman--Bill Richardson. But I sense in Richardson a Gore-like need to impress you to the point of padding the resume. There's the famous (and now retracted) claim he made to have been drafted as a pitcher by the Cleveland Indians. Yesterday, he announced that he was meeting with representatives of the North Korean government toward the goal of re-opening that country's dialog with the United States and the rest of the world. To his credit, apparently, Richardson contacted the State Department. But it would have been far better for him to have announced the meeting, if at all, after it had taken place. The premature announcement looks too much like a publicity stunt. If nothing comes of the meeting, Richardson is apt to look silly. By all accounts, Richardson is a smart fellow. But he doesn't need to be in such a hurry to prove it to everybody. That can blow a candidacy to bits if one isn't careful. I still think that the likeliest candidate to win the Dem nomination in 2008 is Indiana's Evan Bayh. While currently in the Senate, Bayh is a former governor. Still, I don't think that Richardson can be completely discounted. I also wrote about him in a comment over at Rick Moore's blog. Bottom Line: Democrats will be looking for the un-Gore and the un-Kerry to nominate in 2008. That means someone who isn't wooden and isn't philosophically predictable. That explains some of Obama's appeal. That, and the fact that he is a cipher on whom people can presently project whatever they want in a President. Once the senator began making high profile policy pronouncements, one would see that his support is three-thousand miles wide and a half-inch thick, insufficient rootage to make a serious go at the nomination. Other Bottom Line: Hillary Clinton, in spite of the more moderate voting record she has developed in the Senate, is like Gore and Kerry in one important respect. She's a terribly wooden, robotic campaigner. This fact, along with her incredibly high negatives before a single vote is cast will, I believe, convince her to stay out of the 2008 race. GOP Bottom Line: Republicans will be looking for an un-Bush. They'll do so in an attempt to break free of the negatives that have now encircled Mr. Bush. Several candidates can plausibly claim to be an un-Bush. But this post has run too long. So, that thought will have to wait until a later time. None of these are statements about my candidate preferences, just my observations of the always interesting game of politics. (1) I've never been a fan of Thomas Jefferson's. I'm even less so now. Idealists generally assume that because they are trustworthy and pure, they're incapable of doing or saying anything wrong. But these are the very people capable of doing the most wrong, as well as most rapidly violating their own principles. Jefferson always exhibited hypocrisy and was so adept at denial, he never knew that he was hypocritical. Ostensibly an advocate of equality and emancipation, he was a reactionary when it came to any attempts to limit or end slavery. A believer in limited government, Jefferson nonetheless felt little hesitation about entering a probably unconstitutional usurpation of Congressional power when he bought the Louisiana territory from France. Jefferson's most enduring personal trait, one which shone through his public service was running away from conflict. He did this when he was governor of Virginia, secretary of State, and President. He virtually holed himself up in Monticello during his second term as president, particularly frustrating his secretary of State and protege James Madison, when he should have been doing his job. 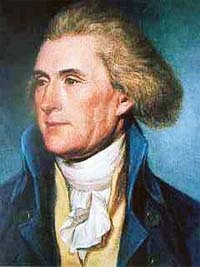 Unlike most of the other members of the Revolutionary generation, Jefferson thought that the break from England was all about liberty, at the expense of society. Except when he was president, Jefferson believed that the individual reigned supreme. (Of course, that meant only white male individuals to Jefferson.) But the more enlightened Washington, Adams, Hamilton, and even Madison understood that freedom without mutual responsibility and accountability is anarchy. Jefferson had a naive belief in the basic purity of (white) human beings and held that if they were given liberty, they could be counted on to do the right things. Jefferson also had contempt for the Constitution. Ellis points out that people like Adams, Madison, and Monroe constantly had to correct Jefferson's misunderstandings and misapplications of the Constitution. In France at the time the document was drafted, he always had misgivings about it. Again, except for his presidential tenure--at least the first term, when he displayed little hesitiation about engaging in an almost imperial presidency--Jefferson believed that the House of Representatives should be the preeminent institution of the federal system. He also believed that if any region of the country should become predominantly urban and dependent on manufacture, the other regions should secede. Such was his regard for the United States of America. Ellis presents a balanced picture of Jefferson. Those who admire him will like this book as much as I did. The New Testament book of Romans is the most mature and thorough confession of faith written by the apostle Paul. This letter was addressed to the first-century church in Rome. Paul wanted to introduce himself before visiting them. He planned to spend time serving and teaching them while gathering an offering to support his next big outreach, to Spain. Romans begins with the basics of Christian faith, how the human condition of sin means all of us are born alienated from God, how that condition leads us to commit particular sins, and how God, unwilling to give up on us, made it possible for all of us to have our relationship with Him restored by turning from sin and believing in Jesus Christ. Paul then addresses how Christian believers are to live the new life Jesus gives to us. Three things should be noticed here. First: We’re to worship God with our whole lives. True worship is a 24/7 activity involving the surrender of our bodies and spirits and the renewal of our minds. Second: Whatever your family of origin, the moment you come to believe in Jesus Christ, you’re part of the one family of God and within it, you have your very own God-designed role to play. Your family is the Church. In it, God blesses you. Through it, you can be a blessing to others. Finally: To help you play your role, God gives you spiritual gifts. The seven gifts Paul mentions here are ones we’ll look at over the next few days: prophecy, ministry (or service), teaching, encouragement (or exhortation), giving, leadership, and compassion. [This is an adaptation of a document I prepared for the Worship Committee at Friendship Lutheran Church, the congregation I serve as pastor. Its purpose is to give members of the committee a quick background on the lessons and themes used on the Sundays of the first three months in 2007. With this information, they'll select the music we'll sing in worship. I also included some musical recommendations, but haven't included them here. I thought this document might be useful to worship committees and pastors in other congregations, since like most Christians in the world, Friendship uses a variation on the lectionary system discussed here. [The Epiphany Season begins after Epiphany Day, January 6. Epiphany Day remembers the arrival of the magicians or wise men--how many there were we don’t know--who brought their gifts of frankincense, gold, and myrrh to the Christ child, some months after Jesus’ birth. [The word, Epiphany, is a transliteration of the Greek word epiphaneo, meaning “I shine upon.” The season takes lessons from the early points when the Deity of Jesus, the light of the world, was seen. [There are seven Sundays in the Epiphany season. Comments: People were looking for someone like John the Baptist to be the Messiah. Instead, it was Jesus. In spite of the many ways in which we strive to make Jesus over in our own preferred images, He stubbornly remains “the God of grace and God of glory” needed by the whole world. Comments: The wedding at Cana was the first sign of Jesus’ deity. “Water into wine” also implicitly introduces us to Holy Baptism and Holy Communion, the first sacrament being our induction into Christian life and the second being a means of grace by which Christ gives us the power to continue in that life. Jesus showed His deity in everyday life, just as we’re called to share Him in everyday life. Comments: Part of proclaiming the Gospel is being an advocate for the world’s poor and forgotten. Comments: This lesson continues the incident in Nazareth recounted in the previous week’s lesson. Jesus is spurned by the people of His home village when, after reading Isaiah’s prophecy of a Savior Who will set things right, He says that He is the prophecy’s fulfillment. Initially, the people of Nazareth are welcoming of Jesus. But after Jesus goes on the rhetorical offensive to show them that He is for all people and that the key issue in His Kingdom is not if you’re connected to Him by religion or family, but by faith, the hometown folks become angry. Jesus, our life with Him, and our Church aren’t meant to be hoarded, but shared. Comments: In response to Jesus’ call, Peter, James, and John make a total commitment to Jesus as Lord. They, of course, will keep this commitment haltingly and imperfectly. But God’s grace allows them to keep that commitment and to truly become fishers of people. God only uses imperfect people for evangelism. Comments: On the mountaintop, Jesus has called the Twelve. Now, He goes to the plain to proclaim His message to people. This is the Luke version of the Sermon on the Mountain, often referred to as the Sermon on the Plain. In it, Jesus gives four beatitudes, statements to the poor and the rich; the hungry and the full; the sorrowful and the joyous; the persecuted and the popular. In Jesus’ topsy-turvy Kingdom, those despised and looked-down-upon are usually in the Kingdom because others tend to view them as self-sufficient and not in need of God. The Church is charged with allowing all people access to Jesus Christ! Comments: After predicting His own suffering and death, Jesus takes His three closest followers--Peter, James, and John--up to a mountaintop. There, after Jesus prays, He’s transfigured, emitting and surrounded by a dazzling light. He’s joined by Moses and Elijah, representing the twin strands of Old Testament tradition, the Law and the Prophets, indicating that Jesus is the fulfillment of all God was about in the Old Testament. Many churches and Christians try to boil down to some predictable box that we can pull out, get a proscribed number of goose bumps, and so continue with our lives. But after this encounter, Jesus leads the three disciples down onto the plain again, away from the goose bumps. The Transfiguration, like turning water into wine and other things we see Jesus do during the Epiphany season, are only “signs” of Who He is and of His coming Kingdom. By God’s mercy, this imperfect and sinning world is allowed to keep spinning so that Christ’s body in the world, the Church, will keep sharing the saving news of Jesus Christ. Until Jesus returns, bringing an end to this planet, Christians live in what the theologians call “proleptic anticipation,” that already/not yet world in which believers know that they’re already a part of Christ’s eternal kingdom, but which hasn’t yet fully arrived. We have many signs of Christ’s universal lordship, including His resurrection. But for now, our task is clear: To tell the world about Jesus so that they too can be part of His Kingdom. Jesus means for us to be the “booths” that point the world to Him. [Ash Wednesday happens on February 21. We’ll have worship that night at 7:00 PM. Ash Wednesday, of course, begins Lent. Comments: God the Father sustains Jesus through His encounter with the devil. At Jesus’ Baptism, which happens immediately before the Spirit drives Jesus into the wilderness, He tells John that He must be baptized. Though Jesus has no sins for which to repent, His baptism is an act of solidarity with us. So too, is His subjection to temptation. It simply underscores how far God is willing to go in order to rescue us. Comments: Paul says that those whose focus is on attaining the comforts and rewards of this world will get them, but lose out on eternity. Our call is to remain riveted on Jesus so that, as Lewis puts it, we gain joy in heaven and have joy on earth thrown in with the bargain. Theme: Bear the fruit of repentance. In other words, live your faith. Comments: Looking down our noses on those who suffer is wrong. All are susceptible to the difficulties of life. Therefore, we need to be prepared for whatever comes by constantly walking with Christ and thereby living the Christ Life. Comments: This is the parable of the Prodigal Son. We are the prodigals welcomed by our Father! Comments: Seven-hundred years before the birth of Jesus, Isaiah speaks for God, saying that God is going to make things new. He says not to be hung up on the old dead ways of religiosity, but watch for Him to breathe new life into those who follow Him. Since God is alive and infinitely creative and since the world in which the Church fulfills its mission is constantly changing, God is probably dispensing new spiritual gifts all the time. Martin Luther, the founder of the Christian reform movement of which the congregation I serve as pastor is a part, once responded to opponents who wanted him to agree with them about how many sacraments there are. Traditional Roman Catholic theology says that there are seven sacraments. Luther and his fellow evangelical reformers said that there are two sacraments for sure--Holy Baptism and Holy Communion. But they also said that confession and prayer might be sacraments. Ultimately though, Luther wrote that only a blockhead would argue over how many sacraments there are. The very title, sacrament, should give us a hint that Luther was right. It’s from the Latin word, sacramentum, meaning mystery. Trying to explain how a sacrament works or why Christ established it is, ultimately, a mystery beyond our comprehension. A sacrament is a means of grace that God defines, not we human beings. The same is true of spiritual gifts. C. Peter Wagner has gone through the three major lists of spiritual gifts from the New Testament (found in Romans 12, First Corinthians 12, and Ephesians 4) and distilled them to a single list of twenty gifts. I myself have always felt that in discerning one’s gifts, confining the search to the seven gifts Paul mentions in Romans is a great place to start. But the simple fact is that only a blockhead would argue that there are only seven or only twenty spiritual gifts. Neither Wagner or I would say that the only spiritual gifts God distributes among believers are those listed in the Bible. All human attempts to box God in are silly, like trying to show the entire Grand Canyon in a 3”-x-5” -photograph, only even more futile. We may be skeptical of the claim a televangelist once made, that he had the spiritual gift of talk show host. But then, the only thing that’s unsurprising about God is that He’s always surprising us. And after all, the surprise is half of the fun in any gift! [NOTE: My friend, Charlie Lehardy, in the comments, said it is hard to imagine Luther using the term "fathead." I realized that, instead, Luther used the term "blockhead," a term which in his day as well as ours, connotes someone who is thick or impenetrable, either in intellect or attitude. Luther used this term, for example, in his essay excoriating the theology of Henry VIII--no mean theologian, by the way--and in his essay aimed at the Lutheran nobility. However, I believe the comment to which I'm referring appears in one of his Table Talks. This is the problem with doing things from memory. But I was so certain that Luther made this observation that I went ahead and included it in the post. If anyone can lead me to the place where Luther said this, shared with me once by a Lutheran church historian, I would appreciate it. [In any case, I am certain that Luther and the other evangelical reformers based in Germany and the Scandinavian countries thought it silly to argue over how many sacraments there are. The Lutheran Confessions, found in The Book of Concord, display their openness to as many as two other sacraments. This six-part series is another of my blogging projects that gets a lot of hits. If you’re not sure what your spiritual gifts are, just do the next thing that the Church needs doing. Don't get so hung up on finding your gifts that you fail to participate in the mission of the Church! Too many Christians say things like, "Someday I'll figure out what I can do for God." That leaves the Church with a lot of Christian thinkers, but very few Christian doers. Joseph Sittler is one of my favorite Lutheran theologians. The Ohio native had a long and distinguished career as a teacher and writer, one that continued long after he “retired” and almost to his death as an aged man. Sittler was one of the first Christian thinkers to understand and write about the environment as a concern of Christian theology. The earth God gives to us, he argued, is something about which followers of Christ are called to care. But how did Sittler become such an “expert” on the environment? He explained in later years that he hadn’t planned it. He had always loved nature and over time, picked up more and more information and insights until, lo and behold, he was an expert. It happened because he simply did the next thing that needed doing. The motivation for finding one’s spiritual gifts isn’t to spend time in endless, self-obsessed navel-gazing. The gifts are tools God gives us to play our parts in the mission of the Church. But there are times when you simply use whatever tools you have at hand to do the task that needs doing. Jack was a fill-in teacher for two years, earning the undying gratitude of the Sunday School superintendent, learning a lot about God, and gaining respect from his students. Jack still doesn’t have the gift of teaching. But he knows something very important: If Christians aren’t sure what their spiritual gifts are, they just do the next thing that the Church needs doing. God honors the efforts of those who “sin boldly” in this way. Are You Setting Goals for 2007 or Beyond? I hope that as you set your goals, you find these little pieces helpful! That's what Alison has us all talking about. Does it strike anyone else as slightly ironic that, if Al Gore actually manages to walk away with both the Statue and the White House, he will have done what Reagan couldn't? Another indicator of what your spiritual gifts may be is what gives you the greatest sense of fulfillment in the ministries of the Church. Shortly thereafter, Bob’s pastor asked him if he would consider becoming part of the Stephen Ministry at their church. Congregations involved in Stephen Ministry have a corps of trained lay people who oversee Christian care groups. Every member is assigned to one of these groups and every group is overseen by a trained leader. Earlier, we mentioned something Frederick Buechner said: “The place God calls you is the place where your deep gladness and the world’s deep hunger meet.” That was true for Bob that night on Joe’s porch. I think it’s true for all Christians who find and use their gifts to glorify God, build up the Church, or share Christ with the world. Charlie Lehardy has the first installment of a new blog series on that theme. As usual, it's wonderful. Rick Moore has a fabulous picture of the shuttle launch, as seen from Daytona Beach, Florida. "This is not a welcoming and caring place"
Yesterday, eight young people from our congregation joined my son, Phil, and me to go Christmas caroling at a nearby nursing home. Below is one of four videos that Phil took during the post-Caroling cocoa time. Only three of the kids remained for that. The video is nothing more than a slice of life, especially a slice of the life of our congregation, Friendship Lutheran Church. But I thought you might enjoy it. Below is a video that Phil took during the after-Caroling Cocoa time. Only a few of the carolers remained. 1. The references to the left and right wings is to two hallways on the first floor of the nursing home. The left wing is where rehabilitation patients live. The right wing is where Alzheimer patients live. We were told not to venture down the left wing because residents there were recovering from bad colds and flus. No politics going on here. 3. Michael insists that he can't sing, even though yesterday I could hear that wasn't true. 4. Be sure to watch for the moment at which Nancy and daughter Devon stuff marshmallows in their mouths to flash what might be described as "Michelin smiles." 5. I don't know why videos on YouTube, where this video is "parked" are slightly out of sync. But they're all that way these days, it seems. No Reaction to ISG in These Quarters: What Does That Mean? Sometimes, when a big news event hits, I make a deliberate decision not to mention it as I daily interact with people. That way, I have some notion of how important the event is to folks and I get a truer fix on what they're thinking. It's an unscientific approach. But, I can be certain that whatever opinions people may express, they haven't been prompted into spouting them by me; they're broaching a topic that's important to them. People talked with me about lots of things this week: personal issues, charitable giving, Christmas travel, helping kids and older folks, the Bengals, Troy Smith's Heisman Trophy prospects and eventual win. Yesterday, when our youth and I went Christmas caroling at a nearby nursing home, one of the elderly people in craft group did mention the war in Iraq, expressing condemnation for it--as most of the elderly I know do. But nobody said a peep about the Baker-Hamilton Commission report. In what may be the most telling indication of how people in these parts are not responding to the report, yesterday when I needed to make a sweep through our local Sam's Club yesterday afternoon, my quick recon of the Book Department determined that the printed/bound edition of it wasn't being sold there. That surprised me because the 9/11 Commission's report was sold at Sam's and appeared to sell briskly. If Sam's, the most adept identifiers of public trends in the US today, hadn't bothered stocking the report, it must indicate a yawning indifference to it on the part of most Americans. 1. People are busy. They're getting ready for Christmas and other holidays, after all. All my family and friends in retail tell me that the malls are packed and that people are buying briskly. 2. Maybe the sheer number of recommendations in the ISG report prevents people from focusing. If the panel had offered five recommendations, rather than almost eighty, people might be talking more. As it is, grappling with it is a bit like trying to shake hands with an octopus. Of course, the commission members would argue that when dealing with an issue of the magnitude of the war in Iraq, it's not possible to distill recommendations down to memorable sound bites. 3. People are as perplexed by the war as everybody in Washington appears to be. They're frustrated by the war, whether they support it or oppose it. (And most people in these parts seem to support the war, although they want to get it over with.) They don't know what the right "way forward" might be and they're not sure if the Baker-Hamilton team knows either. Maybe folks feel that Baker-Hamilton hasn't really said anything new. None of this has anything to do with my personal opinion. I think that Baker-Hamilton is important. My guess is that if I were to actually ask people around here what they would think, they would deem the report strong on diagnosis, but weak on prescription. And that would be no slam. People seem to feel that no prescription is going to work. And that may be the big reason nobody says anything about Baker-Hamilton: They fear nothing will work. All I know for sure is that if the non-response to the report evidenced by people around here is echoed in most of the rest of the country, it's not likely to have the impact that the distinguished panel who presented it would like it to have. Another way to determine your spiritual gifts is to try your hand at a ministry of the Church for which you’re not certain that you’re suited and so, risk failure. A businessperson was once asked, "What is the secret of your success?" "Making good decisions," he said. Intrigued, his interviewer asked, "How do you learn to make good decisions?" His answer? "By making bad decisions." Failure is a great teacher and when you follow Christ, never to be feared. Failure teaches several things. First: It teaches that we’re neither God or the most important or most talented people in the world. Second: It teaches us what we’re not good at, freeing us to focus on that at which we really are good. Third: It shows us that in spite of our fears, failure isn’t fatal. Fourth: Failure shows us that, even when we fail, as Saint Paul puts it, “nothing can separate us from the love of God in Christ Jesus our Lord" (Romans 8:31-39). Martin Luther was once asked how to determine God’s will for our lives. Of course, we’re to read God’s Word, pray, and seek the counsel of trusted Christian friends. But Luther said, if after all of that, God’s will still isn’t clear to us, we should “sin boldly”: We should do what we think is the right thing, even if we don’t know it for certain. Many people are afraid to volunteer for established ministries of the Church or to pursue their visions of new ministries because they’re afraid of failure. But no one who genuinely seeks to glorify God, serve the Church, and share the Good News of Jesus Christ with others will be doing wrong even if they fail. And it’s the failures that teach us the most about what we’re most gifted to do as followers of Jesus Christ! her 'Art Muse' has returned. Good! Hugh Hewitt had a post on his blog back on December 1, which at a very busy time, I failed to mention here previously. There, Hugh suggested that during this Christmas season, churches might be interested in taking offerings for organizations that care for wounded US military personnel and the families of personnel killed in action. No matter what one's position on the wars in Iraq or Afghanistan, our veterans and their families need our support, help, and appreciation. That should be an utterly non-partisan issue. And we Christians should be particularly attuned to the suffering, struggle, and sacrifice endured by others, not least of which should be these military families! Of course, Christmas isn't the only day when Christians are called to care for others. So, whether our financial support comes through our congregations or simply from us as individuals, support for these organizations is one way to express love for others all through the year. For more details, go to Hugh's original post. I just learned from a Rachel Sklar article at Huffington Post that this weekend had been designated as one for special prayer for the people of Darfur, the victims of genocide on the part of the Sudanese government. Had I known this, I certainly would have included prayers for Darfur in the Prayers of the Church during our congregation's worship celebrations on Saturday and Sunday. Prayer seems particularly apt because of the maddening, tragic intractability of the suffering in the Darfur region of Sudan. As I've mentioned many times before, Frank Laubach, the Methodist layperson who began the worldwide literacy movement which bears his name, said that prayer only really happens when faith in Christ is matched with the sense of helplessness that means we no longer rely on our own cleverness and allow us to rely on God. Laubach also said that far better than our lobbying world leaders to pursue the courses of action we deem appropriate from the standpoint of our own limited wisdom, is for us to pray that God would give leaders His wisdom and that the leaders would be open to it. Given that I can't figure out how best to resolve the tragedy in Darfur, that seems like good advice. Of course, if one isn't careful, such a stance taken to an extreme could justify a quietism that stands by while all sorts of injustices are perpetrated. A seminary professor of mine used to append a note to the blue books in which we wrote the essay responses to his test questions. "Ora et labora," Tryg Skarsten wrote, sharing a Latin phrase meaning, "Pray and work." Sometimes when we pray that God will give our leaders guidance, God turns around and gives us guidance for what we should say and do in the face of injustice and other horrible tragedies. God sometimes tells us to be the answers to the prayers we offer. So, I'm going to pray for a resolution of crises from Sudan, to Iraq and Afghanistan. I hope that you'll do the same. But none of us should be surprised if God's answer is, "You be the solution." Then our prayer must be, "God give us the courage to do what You seem to call us to do." We all know what it’s like to prepare for special occasions. We’ve all prepared for something: a wedding, a college entrance exam, a solo in church, a major presentation, a big game. But here’s what I’ve learned about most special occasions: The real learning, the growth, the sense of fulfillment, the challenge, and the heart-pounding, soul-uplifting success special occasions bring seldom result from the occasions themselves. All of those things--learning, growth, fulfillment, challenge, success--happen in our preparation for things. When you’re prepared, special occasions themselves seem as natural as the sun coming up in the East. A number of us have participated as members of a giving team or a receiving team or both for one of our Renewal Weekends. Having been on both kinds of teams several times, I can tell you that as wonderful as it is to be a receiver of such a weekend, with its opportunity to grow close to God in a relaxing atmosphere, the people who grow the most and enjoy it the most are the members of the giving teams. They’re the ones who have spent nine to twelve months growing in their reliance on Jesus Christ and learning to love their fellow team members, warts and imperfections and all. And once the weekend comes, their minds and hearts are so prepared, they can truly savor the blessings God brings. Our Bible lesson for this second weekend in Advent comes to us from one of the early chapters of Luke’s Gospel. Here, the ministry of Jesus’ relative, John the Baptizer, is described. Luke does this with words from the Old Testament prophet Isaiah, words that portray John as a highway builder who prepares the way for Jesus Christ to enter the world. Like the builders who blasted and dug and filled their ways through the hills and valleys of northern Kentucky to give us the I-275 loop around Cincinnati, John laid the boastful sinner low and raised up the humbly repentant, that person willing to turn away from sin and turn toward God, so that everyone would recognize their Messiah Savior when He showed up. John told the people that if they would truly turn to God, they would be prepared for the Savior. They would see their salvation because the Messiah could only be seen by those who saw their sin and knew their need of a Savior. No one else would be prepared, John warned. That's still true for us today. We too, need to turn from our failures to love God and love neighbor--from our sin. We need to renounce sin and turn to God in order to be prepared to have Jesus at the center of our lives. We don’t need to be perfect, thank God. We do need to keep our attention focused on the God Who comes to us in Jesus Christ. “Max Lucado tells the story of a man who had been a closet slob most of his life. He just couldn't comprehend the logic of neatness...Why [for example] put the lid on the toothpaste tube if you're going to take it off again in the morning? The man admitted to being compulsive about being messy. Then he got married. His wife was patient. She said she didn't mind his habits... if he didn't mind sleeping on the couch. Since he did mind, he began to change. He said he enrolled in a 12-step program for slobs. A physical therapist helped him rediscover the muscles used for hanging up shirts and placing toilet paper on the holder. His nose was reintroduced to the smell of Pine Sol. By the time his in-laws arrived for a visit, he was a new man. You can bet that man was prepared for the return of his wife. But not because he dreaded being nagged. It was because he had changed the way he thought and lived. Advent is a season of preparation. We prepare to celebrate Christmas, the festival of Jesus’ birth, to be sure. Christmas songs and lights, decorations and cookies, special movies and gatherings with friends, Advent wreaths, Christmas caroling, and Christmas Parades all help us with that. But in Advent, we're reminded to prepare to meet Jesus today, everyday, and at the end of days. And the ones who are truly prepared to meet Jesus each day are the people who bulldoze away the obstructions in their relationship with Christ, things like sin and selfishness and rudderless living. They’re the people whose lives and ways are cleaned up by exposure to a higher standard of living, the highest standard of living, life in the gracious Kingdom of Jesus, where forgiveness and salvation aren't earned, they're only received by those who trust in Christ. The people prepared to welcome Jesus are those who attune themselves to Him through all the days of their living. They learn that being focused on the grand goal of welcoming Jesus when He comes to us is the only way to turn our profusion of mundane days into one wonderful life. John the Baptizer would call it a life prepared for the coming of the Savior. Are you prepared for Christmas? Prepared to have Jesus with you 24/7? Prepared to meet Him at the end of your days or the end of this world? You can be. This Advent season, we need to remember that whatever the occasion--special or otherwise, the only person who is truly prepared for life is the person who daily renounces sin and daily welcomes the forgiveness God grants to all who surrender to Jesus Christ, the God, King, and Savior not just of the world, but of you and me. I pray that by the power of God’s Holy Spirit, we all will be prepared for Christmas, for the ends of our lives, for the return of Jesus to this world, and for meeting and walking with Him each morning when we wake up and every night before we fall asleep! Yesterday, we said that the first thing to do to determine your spiritual gifts is to ask. We should first, ask God, and second, ask trusted Christian friends who will tell us the truth. Third: Ask the Church. By this, I mean the more formal decision-making groups of the Church. Jesus created the Church to be a fellowship of mutual accountability. That’s part of what it means to call the Church the Body of Christ. Expanding our vision means being on the lookout for new ministry opportunities--new ways to share the Gospel, to bring people into the fellowship of the Church, and to serve others. My dream is that people will constantly find new ways to use their spiritual gifts that will engage them in our mission. Along the way, they’ll be asked to come to our Church Council for guidance, refinement, and affirmation and sometimes, funding. No matter what spiritual gifts we may think we possess, Christ has made each of us accountable to His Body,. Fourth: Ask yourself. Frederick Buechner, novelist and pastor, observes: “The place God calls you is the place where your deep gladness and the world’s deep hunger meet.” What activities trigger gladness in you, while filling a need experienced either by those within the Church or those outside the Church, people Jesus Christ wants us to reach? Those activities may use your spiritual gifts. The first thing to do to determine your spiritual gifts is to ask. Ask God, ask a trusted Christian friend, ask the Church to whom all Christians are accountable, and ask yourself. Bible Passage to Ponder: “There is one body and one Spirit, just as you were called to the one hope of your calling, one Lord, one faith, one baptism, one God and Father of all, who is above all and through all and in all” (Ephesians 4:4-6).